"How to Start Your Own Successful Fashion Line"- Business Mentoring-Program! Revealing the Business and Marketing Secrets to Fashion Success! If you are studying fashion, are a designer or simply want to start your own clothing or accessories line, this is the MUST KNOW business program for Fashion Start-Ups! Since you're here, you've probably heard me speak on stage, and have heard about my successful career as a Fashion Designer, Retail Buyer and Business Owner. As part of my job, I Travel overseas frequently, Research the latest Fashion and Retail Trends and do what I love- Design! I’ve had so many other budding fashion designers and small business fashion owners ask me- ‘’How’d you do it?’’ and can you share with me your secret to success?’’ That’s why I have decided to put together this mentoring program. It's a step-by-step program where I will show you exactly what you need to do to successfully launch your Fashion Line, and market it to get sales!! 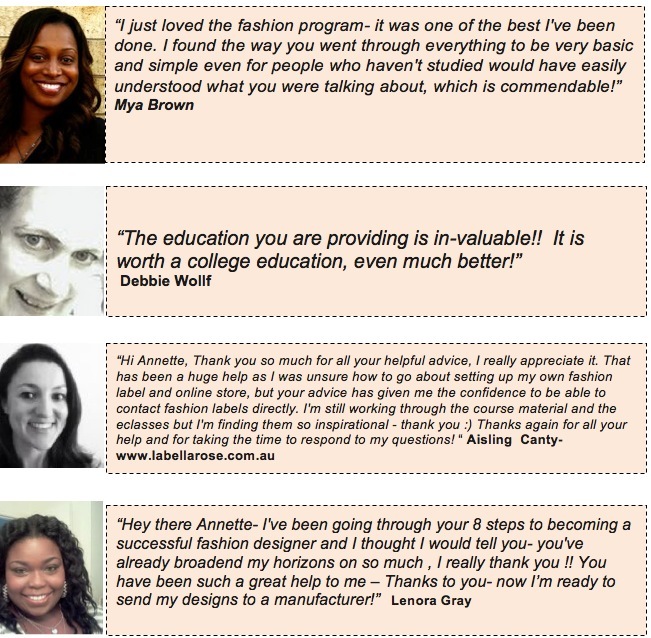 Easy-to-use, Step-by-Step Program to Make Money From Your Fashion Designs!! It Includes All the Things That You Wont Get at Fashion School! How You Can Start to Live Your Dream- TODAY- even if you are still studying or working Full time! Simple and Easy ' 8 STEP PLAN' to Launching Your Own Fashion Line'. Even if you are new to Fashion, and don't know how to sew! How to Register your own Business Name and Start Your Own Fashion Label- for less than $150!! How to overcome Fear so you can get started- and do what you love! Step-by-Step instructions on How to Get into the Fashion Industry- even if you have never Studied Fashion before, or worked in the industry. Contact Lists of Clothing manufacturers and Suppliers- that you can use to get your designs made, and manufactured. A list of 10 Wholesale Fabric Suppliers so that you can design with the best fabrics that don't cost the earth! 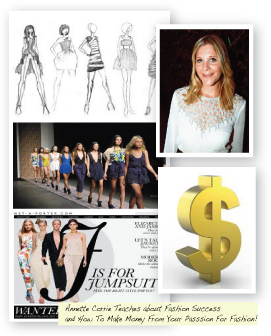 Access to the members-only website with valuable information about making money from your fashion designs. Marketing Strategies to Sell Your Designs- Top Marketing Ideas to market your fashion label that cost next to nothing to do. Easy- to- Follow Video Instruction on How to Start Your Own Face book Store- to sell your designs to Friends, Family and Fans!! Media Contact List- The contact Email Addresses of some of the Best International Fashion Magazines and Media Publications. 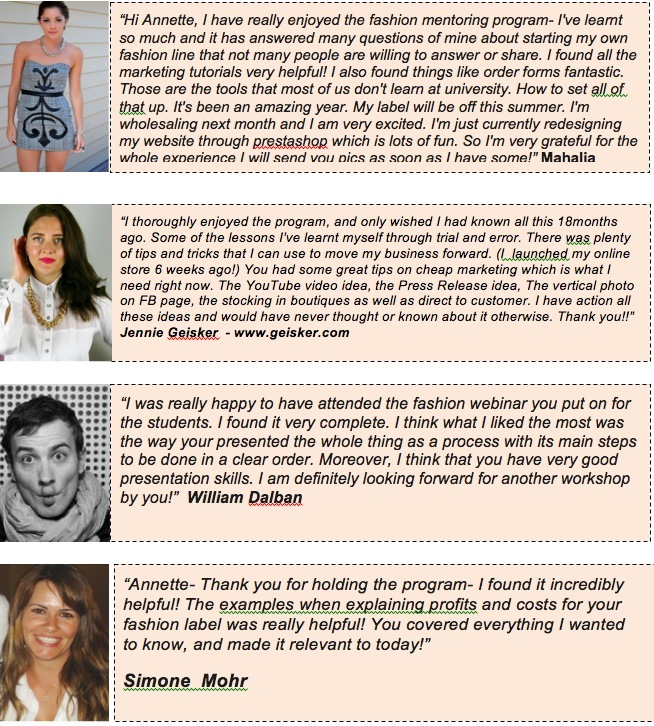 Interviews with top fashion industry professionals revealing the secrets to becoming successful in the industry. Fashion Blogging for Profits Manual teaching you how you can make money from your very own fashion blog, and sell your designs at the same time. Email support from our fashion success team, helping you get the most from your membership. Weekly e-classes which are emailed to you. These take you step by step through each process, with heaps of examples, tool, tips and templates. All Of this For Only $49 Per Month! Success Business Mentoring Club For? At this stage we have 12 months worth of material and there's more in development. However you can stay for as long as you like. There are no fixed contracts - you pay on a month by month basis. This means that you can unsubscribe at any time, when you feel you have learned what you need. However most of our members stay on as they enjoy being guided, and love being part of a successful group of Fashion Designers. 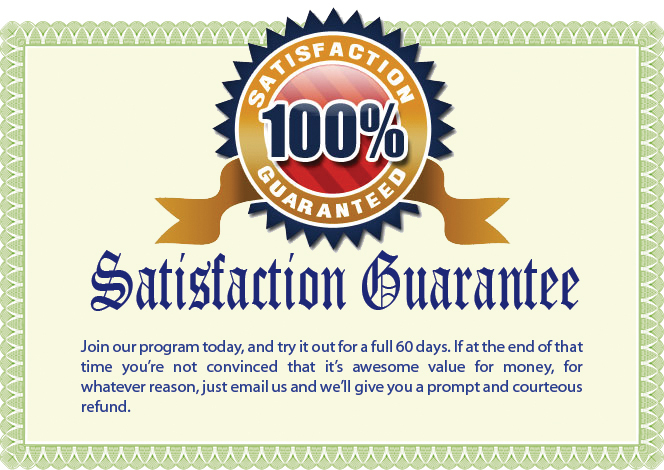 I look forward to welcoming you on board and getting results happening for you! PS: Don't wait another day to realize your full potential as a successful fashion designer. The longer you procrastinate, the further you are away from earning a good income for your fashion talent! PPS: Remember, it's the not the best designs that get the most sales- it’s the best fashion marketing!